2013 WSOP main event runner-up finisher Jay Farber has just joined the field. Farber finished fifth in the 2018 CPPT Venetian DeepStack Championship Poker Series $5,000 buy-in main event this summer for $134,083. He will look to add to his $5.5 million in live tournament earnings with another deep run here at The Venetian Poker Room. With a flop of 7 2 2 Jay Farber checked to Anthony Zinno, who bet 30,000. Farber check-raised to 75,000 and Zinno called. The turn was the J and Farber checked. Zinno bet 125,000 and Farber called. The river was the 5 and both players checked. Farber showed the 10 7 and Zinno mucked his cards. Farber chipped up to just over a million, while Zinno fell to 950,000 after the hand. Men Nguyen raised to 40,000 from middle position and Jay Farber moved all-in for 276,000 out of the big blind when it folded around to him. Nguyen made the call with the A 10 . Farber had picked up the Q Q . The board ran out K 7 6 4 7 and Farber faded the flush draw and over card outs Nguyen had going into the river to double up to over 550,000. Nguyen was left with 150,000 after the hand. On a flop of J-J-2, Paul Hoefer found himself all in holding pocket kings, only to see he was up against the pocket aces of Jay Farber. The turn and river were no help to Hoefer, who finished second in this event in 2017. 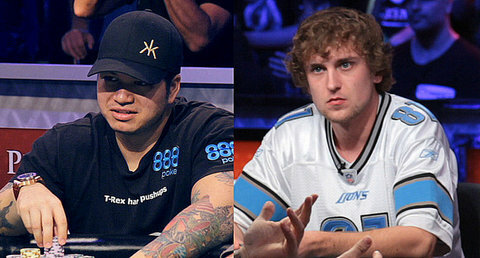 Hoefer was eliminated while Farber chipped up to 975,000. It was a battle of the blinds and we picked up action on the turn with a board of 9 7 2 4 Bryan Piccioli bet 135,000 and Jay Farber called. The river was the 7 and Piccioli moved all-in, having Faber covered. He thought it over before making the call. Piccioli had rivered the flush to win the pot, sending the 2013 WSOP main event runner-up to the rail in fifth place with $134,083. Down to his last 14.2 million, Farber shoved over a button raise of 2.5 million and Riess made the call with A K .
Farber was drawing live with his Q 5 , but a flop of J 10 4 took away some of his outs. The turn was the 3 and a teary-eyed Riess moved closer to his rail before falling to a crouch awaiting the eventual river card. Farber needed one of the three remaining fives in the deck to stay alive, but the river was the 4 , ending his tournament run in second place. Riess and his supporters jumped in celebration, rushing the stage as an explosion of streamers and confetti littered the stage and theater. For his runner-up finish, Farber banked $5,174,357. Riess, who was overcome with emotion in victory, earned $8,361,570 and the title of world champion. American players Jay Farber and Ryan Riess are the final two remaining at the 2013 World Series of Poker main event final table. With nearly 191 big blinds in play, Tuesday night’s heads-up battle is sure to be a classic. Join us Tuesday at 5:45 p.m. PT when we resume play to determine who will be crown champion and take home the $8,361,570 first-place prize.